First of all you need a human … check , Secondly you need a canine… check. Now you have the main components you’re almost ready to go. Canicross is the sport of cross country running with dogs, it is dog powered, so they are harnessed , attached to the human and run in a team. The human is the driver, directing the dog from behind with voice commands. Canicross not only is a great method to get a human and a canine fit but works the dog’s mind and allows them to use their brain in a work mode. 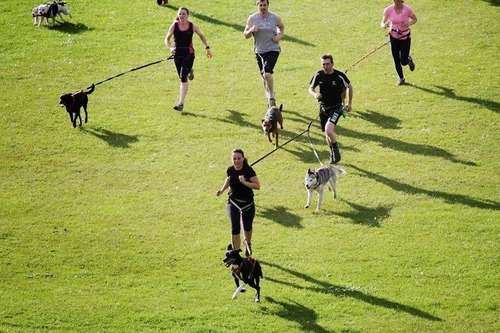 As long as your dog is fit, healthy, of the right age and able to run, you can really canicross with any dog. Working breeds tend to be the more popular breed for this sport. Always consult your vet when unsure. Dogs can race after they reach 12-18 months of age, you can start some light training with them a few months before this to allow them to get used to being in a harness and to teach them their commands, then gradually build this up, always be careful not to over work the dogs when their joints and bones are still forming. For larger breeds it is important to wait a bit longer to build up greater miles. Again always consult your vet for advice. Equipment can be a bit of a minefield, it is like anything in life, there are options that work for one and not the other. The basic key factors for equipment are a good comfortable fitting harness, which is suitable for running. A bungee line/lead and a waist/hip belt for the runner. There are so many different styles and makes of harnesses on the market. So how do I know which is right for canicross and my dog? Ensure the harness is comfortably fitting; you can fit two fingers around the neck, chest and waist. Avoid a harness that restricts the dogs breathing, something that presses on the chest, or digs into rib cage. You want the lungs to freely expand so ideally something that is free from the dogs ribs. Connection point of line to runner is very important to consider also e.g. an x back harness is designed for a lower connection point used in sledding/mushing. 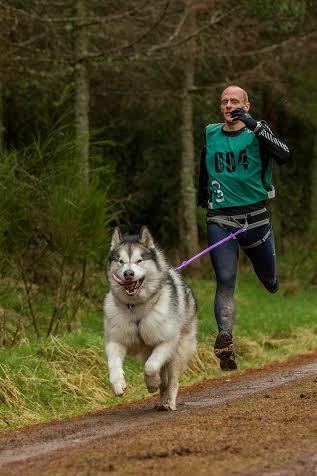 In Canicross the connection from dog to runner is higher, so you need the harness to be slightly shorter. If the harness is too long on a high connection then the dog will be pulled up from underneath. Listen to how your dog sounds when running, if wheezing then there is something restricting, watch how they move, if their movement is off balance, or equipment is being pulled to an angle then perhaps fit of harness and line isn’t right. It is important to have a bungee integration in your line, the bungee is to absorb shock for both you and the dog. If there is a sudden jolt or a strong pull, the elasticity will absorb these. Length is important to consider also, as if it is too long, you may trip over, or it may allow your dog to weave off path. If it is too short it could pull on the dog’s back and cause you to run into them. Ideal length is 2m at full stretch. A strong secure waist or hip belt is important, to allow you to run hands free, and also take the pull of the dog comfortably. A waist belt should fit neatly round your waist, with room for expansion if needed over heavier clothes. A hip belt should be secured with leg straps, this is advisable for faster runners with strong pulling dogs, as it allows the runners body to keep upright and the pull work from underneath the bum. Trail shoes are always good when running off road, this will give you more grip on trails and allow to get through mud without slipping. 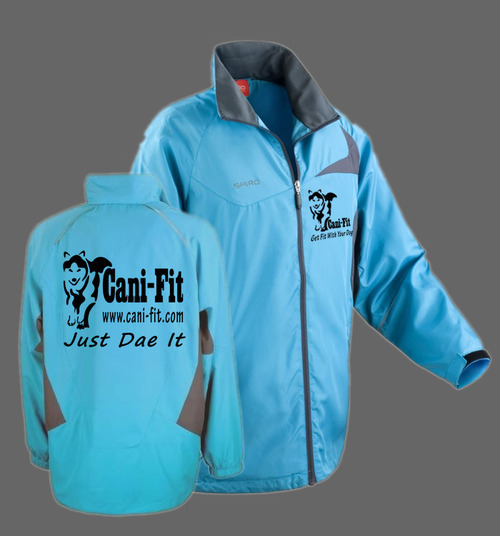 Light weight breathable running clothing is most comfortable, and if you are in Scotland you may want to invest in a good light weight waterproof. Well as it is a cross country sport, off road is always best, local woodland parks, or forestry trails are great to get started, lots of technical work for both owner and the dog, but soft enough underfoot. It is important to mix up terrain when training, harder ground can be equally as important as a softer ground, too much of one thing can cause issues either way. Try avoid too many miles on tarmac as it can be bad for both human and dogs joints not to mention pads, but avoiding tougher ground will keep dogs pads too soft and could lead to flat footing. Mix up your trails for best all round training. How to train my dogs directions? A lot of canicrossers use mushers terms to help drive their dog, you can use any term you wish, so long as your dog understands and you are consistent with what you say and how you say it. These are just examples of commands I use. When training your dog commands, you want to repeat when they go in the directions and praise after the word, similar to how you would teach basic obedience, lots of praise when they are on right track will help them pick it up better. Avoid using treats, as it is important the dog focuses on the track out front and doesn’t turn back to look at you. Eventually the dog should face forward and just use their ears to take the commands without turning their head. Use your own body to help create or slow speed, if you speed up and run faster picking up pace, your dog should pick up on this and do the same. If you want to slow pace down, try use your body weight to lean back into your belt and lengthen your stride to help slow the pace down without grabbing the line. Once your training session with your dog is done, give them a bowl of fresh water, a small treat , remove their harness and lots and lots of praise “good job”. It is important they know they done well at the end of every session, the more positive you are about their efforts the more they will work for you. 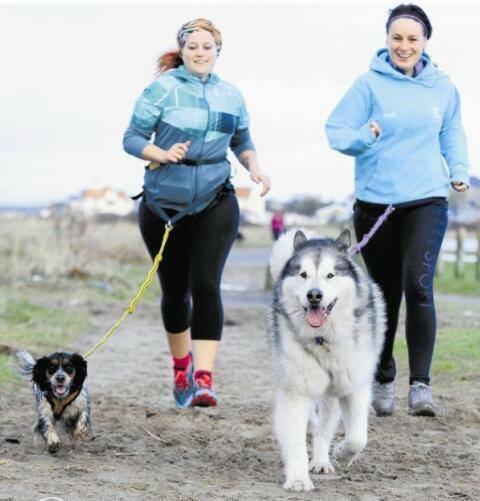 Now you have the basics of how to, all you need to do is to get out running and enjoy getting fit with your dog.